Nidec Motor Corporation develops and produces a wide array of motors for a number of different applications. Among these, pump motors used in applications such as water supply systems, wastewater, irrigated agriculture and fountains are especially representative of our business. 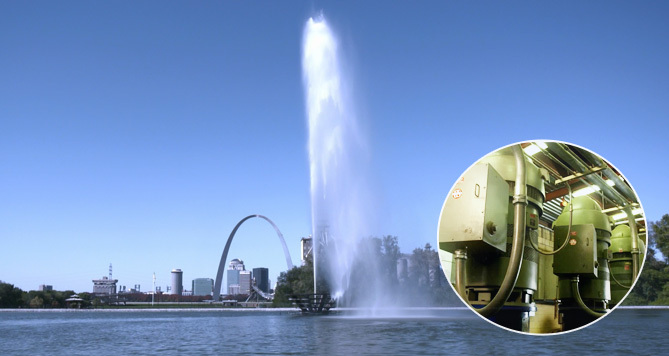 For example, the famous gateway geyser (East St. Louis, Illinois), ranking as the second tallest fountain in the world and the tallest in North America with its height of 192 meters (630 feet), is powered by pumps driven by our vertical motors. The characteristic feature of these motors is their ability to withstand the high thrust generated in the direction of the bearing axis by the lifting power of the propeller. This mechanical stress is otherwise known to cause problems when it comes to high-output pump motors. The 800-horsepower motors powering the fountain utilize a hollow shaft construction coupled with high-strength bearings to withstand the thrust of up to four to six tons exerted upon the motors as the fountain erupts. Furthermore, the lubrication system is based on an oil film which prevents galling. These factors combined, have resulted in 20 years of continuous trouble-free operation. Another example of Nidec Motor Corporation's motors being put to use which has contributed to the establishment of our name, can be found in Sochi, Russia where our pump motors are being used in snowmaking machines, installed at a ski resort, which were used without any modifications during the 2014 Sochi Winter Olympics. These 1000-horsepower motors, as well, are designed to withstand heavy thrust loads. Other applications in which our high thrust designed motors are used include a large scale irrigation facility in California as well as applications in the oil and gas industry. Many of these motors have been operating for over 40 years without any issues, supporting our daily lives as a part of society’s infrastructure. Recently, the concept of IoT (the Internet of Things) has garnered attention in a variety of fields. At Nidec's factories in Japan, for example, sensors are being attached to press machines to collect and analyze data sets and predict breakdowns before they happen. Similar IoT based failure prediction systems are planned to be introduced as a product feature globally across the Nidec group. These systems are especially well suited for the water supply, wastewater, gas and oil fields in which Nidec Motor Corporation is expanding its business and we plan to actively work towards improving our products through the implementation of IoT based technology.